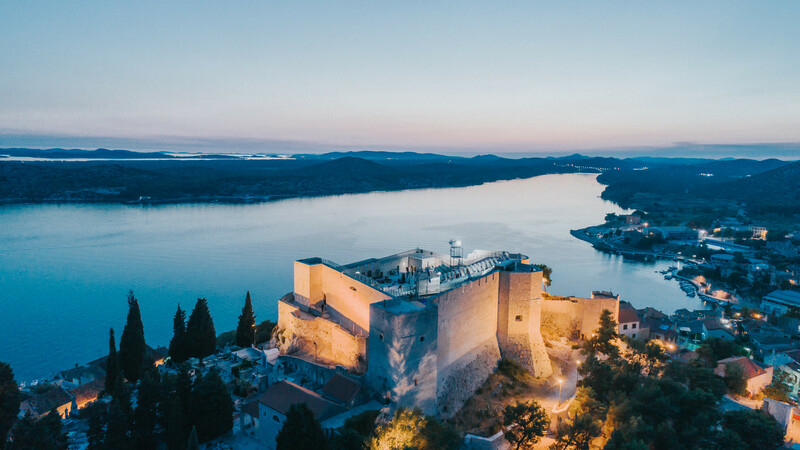 One of the first things that visitors see when entering Šibenik by road is the silhouette of St Michael’s Fortress, which crowns the pyramidal hill above Šibenik’s Old Town. 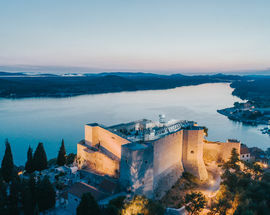 Its importance to the Croatian state is illustrated by the number of times that 11th-century Croatian kings brought their court here – Petar Krešimir IV in 1066, Zvonimir in 1078, and Stjepan II in 1080. 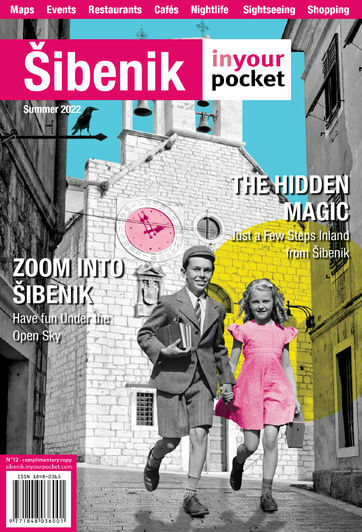 It was during Krešimir’s visit that Šibenik was first mentioned in official documents, which explains why the city is sometimes known to this day as “Krešimir’s Town”. Its floor plan has the shape of an irregular rectangle. 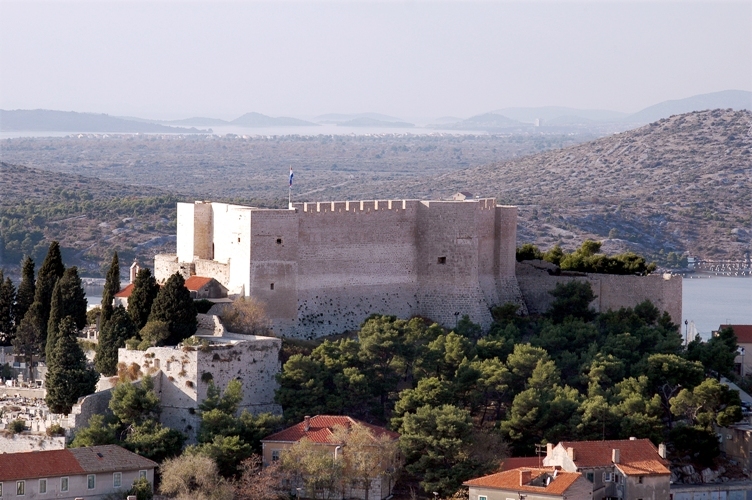 There are two square towers on its eastern side whereas two polygonal towers sit along its northern front. 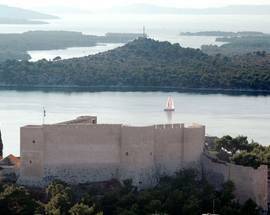 Throughout history, the fortress had been repeatedly destroyed and rebuilt, and it experienced its greatest suffering in 1663 and 1752. 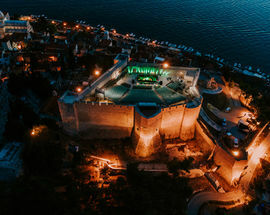 Archaeological investigations inside the monumental complex have found numerous remains of material culture dating from prehistoric times to the late Middle Ages. 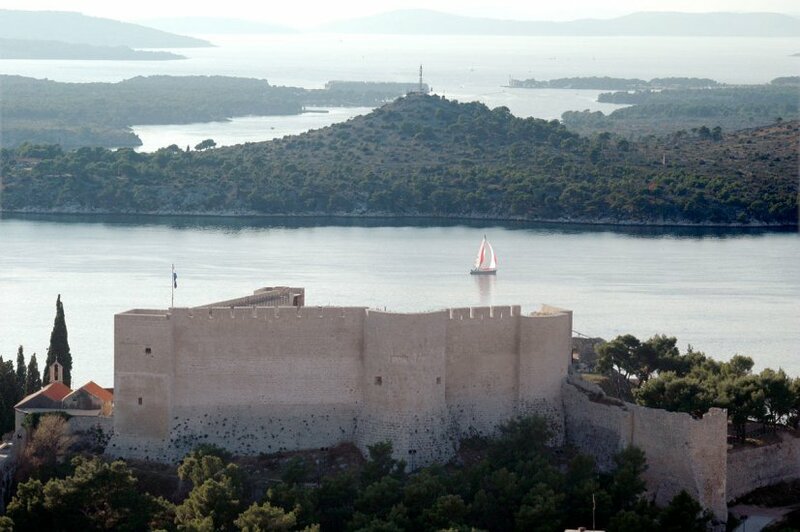 Running downhill from the fortress towards the seafront are a crenellated set of double walls built in the 15th century to provide access to the sea. 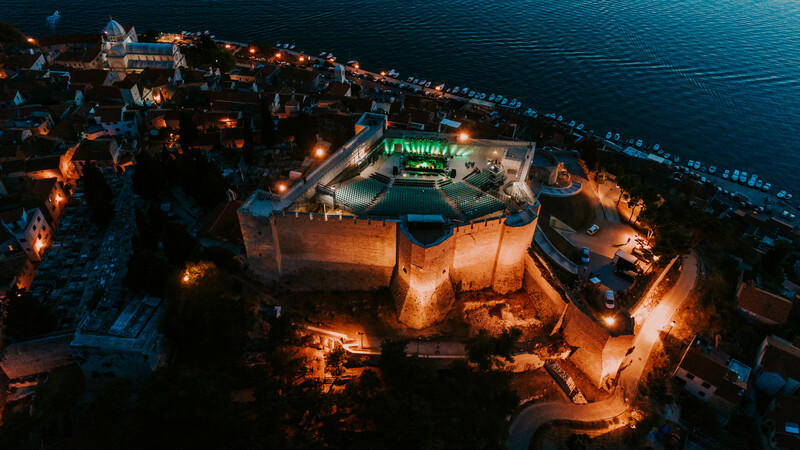 Centuries on and despite its majestic yet turbulent past, St. Michael’s Fortress stands proud as a true landmark of the city, an unavoidable destination of cultural tourism and of utter national significance. 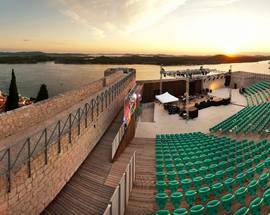 Nowadays and after extensive reconstruction, the fortress serves a different purpose; it has become a summer stage for various cultural and in particular musical events thanks to its natural beauty and location. You have most likely seen live acts perform in arenas, stadiums, concert halls, but have you ever seen artists perform live in a fortress? 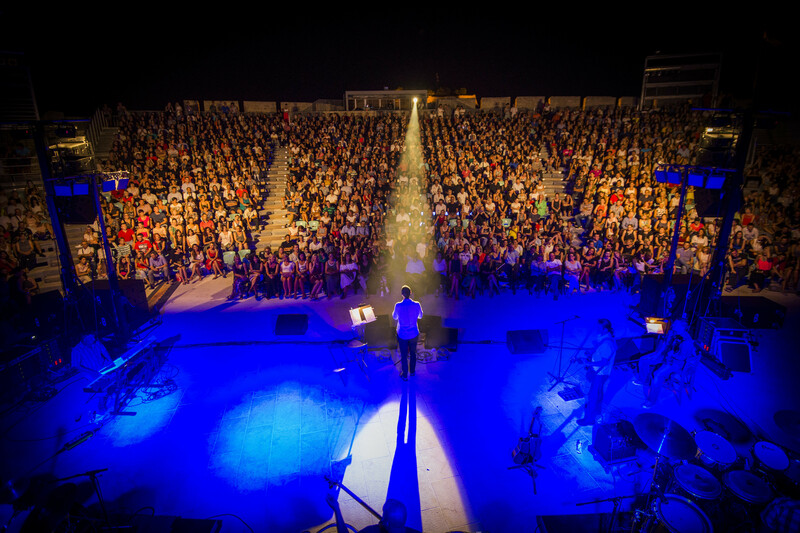 If not, here is your chance in seeing some outstanding world class performances under a starry sky, with incredible acoustics and beautiful views that will surely give you an entirely new musical experience. 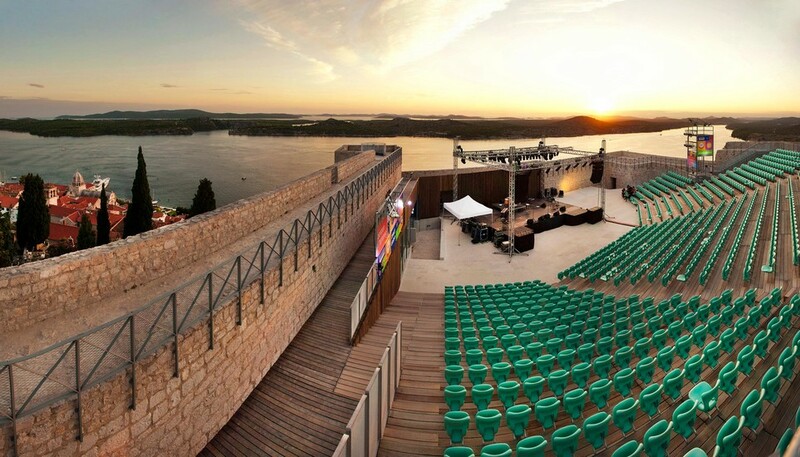 Many have dubbed it as one of the most prestigious venues in the entire region and with over 40 exclusive cultural events and concerts this summer which include the likes of Bryan Ferry, Mario Biondi, Kruder & Dorfmeister and the National Folk Ensemble LADO, take a peek at what other mega acts are going to bless the fortress stage this summer in What's On Chapter. Admission 60/40kn (family 140kn). 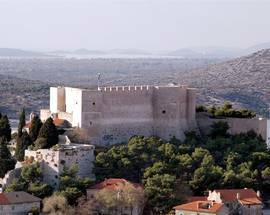 Another option is unified ticket valid for seven days, for visiting both, st.Michael's and Barone fortresses: 70/45kn (family 160kn).